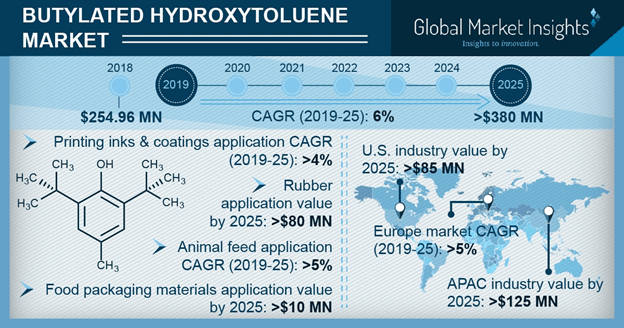 Butylated Hydroxytoluene (BHT) Market size is set to reach USD 380 million by 2025; according to a new research report by Global Market Insights, Inc. Intensifying demand for synthetic antioxidants owing to their increasing utilization for preserving food products in order to increase shelf life will boost the BHT market growth. The product inhibits oxidation and has its applications in several industries including cosmetics, food additive, lubricating & specialty oils, food packaging, animal feed, and pharmaceuticals. Global butylated hydroxytoluene market from food application is anticipated to exceed USD 90 million in projected timeline. The product prevents food spoilage which caused from mold, bacteria, and yeast. It helps to prevent or delay changes in food texture, flavor, and color. BHT is added to several food products including cookies, snacks, fats & oils, meat, and dressings. Rising urbanization and purchasing power of consumers will surge the market growth. Butylated hydroxytoluene creates an adsorption film on metal surface thus it acts as corrosion inhibitor for carbon steel in biodiesel blend B20. Use of biodiesel as a fuel reduces exhaust emission as compared to petroleum diesel and gasoline. Rising environmental pollution levels due to increasing greenhouse gas emissions will drive biodiesel demand hence fortifying butylated hydroxytoluene (BHT) market size. Feed antioxidants including BHT helps to improve immunity against animal diseases. The product is thus added to cattle feed in order to increase its shelf life. Rising research activities to prevent cattle diseases will drive cattle feed industry hence, surging product demand. Global BHT market from lubricating & specialty oils application is anticipated to exceed USD 40 million in projected timeline. BHT functions as an antioxidant and stabilizer for several fluids and synthetic oils including brake fluids, transmission fluids, hydraulic, spindle, slushing, and cutting oils. Rising automotive and industrial sectors in Asia Pacific due to economic growth and foreign direct investments will spur product demand. Increasing research and development to determine side effects of butylated hydroxytoluene for use in medical doses, cosmetics, and food may negatively impact industry growth. Skin & eyes irritation, and other health problems related to BHT may hamper industry profitability and market price trends. China butylated hydroxytoluene (BHT) market may witness considerable gains over 5.5% by 2025. BHT owing to its food preserving and antioxidative properties is extensively added to food packaging products. Rising demand of attractive food packaging sheets and plastics in order to lure customers will enhance butylated hydroxytoluene (BHT) market size. Butylated hydroxytoluene (BHT) market from personal care & cosmetics application may witness considerable gains up to 4.5% by 2025. It neutralizes free oxygen radicals, increases shelf life, and stabilizes colorants in personal care products. Growing demand of skin and sun care products due to changing climatic conditions & global warming will drive cosmetics industry growth. This will surge the market growth. U.S. BHT market is anticipated to exceed USD 85 million in projected timeline. The product functions as a preservative and antioxidant for manufacturing animal feed products. Increasing number of animal feed manufacturing mills in the region due to growing animal population in the region will fortify regional industry size. Butylated hydroxytoluene market from industrial fats, oils & fatty acids may witness considerable gains up to 4.5% by 2025. BHT owing to its rancidity development preventing properties has applications in industrial fats, oils & fatty acids. Growing automation and robotics trends in manufacturing sector will spur industrial oils demand which will enhance industry size. Global BHT market share is moderately fragmented with key industry precipitants including Eastman Chemical Co., Sinofi Ingredients, Kemin Industries, OXIRIS, KH Chemicals, and Sasol. Manufacturers are investing heavily in R&D, product innovation and capacity expansion in order to cater increasing industry growth.